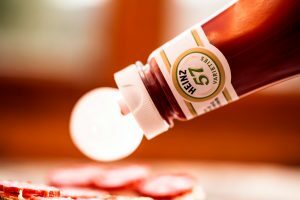 In a basic game of word association, if I say “Heinz,” there’s a good chance you’ll say, “57.” That famous connection refers to the words, “57 varieties,” on their labels, which most people associate with how many kinds of pickles the company makes. It’s kind of true, but mostly not. In the 1800s, Henry J. Heinz saw an ad for “21 varieties of shoes” and liked it. So he chose an odd number that he thought would be memorable, and the company has used it ever since. But there is no direct correlation to the number of products they make. Another famous Pennsylvania brand has developed considerable folklore around its association with a number. Rolling Rock beer has had “33” on the back of its bottle since its debut as a brand in 1939. The mysterious origins of that numeral have been debated ever since, with no definitive answer. A prevailing theory is that it’s simply a copywriting notation, referring to the number of words in the beer’s quality pledge immediately above the numeral, which was mistakenly typeset. Some more outlandish theories are that 33 streams feed into the reservoir from which the brewery draws its water and that Groundhog Day is the 33rd day of the year. There are many more and for Rolling Rock, that’s the beauty of it. This ongoing conjecture keeps people talking about the product, and it sustains a folksy mystique around the brand. The irony of using numbers in a brand to associate meaning of some kind is that the meaning is often lost over time. WD-40 and Chanel No. 5 both are references to how many formulas were tested before a winner was discovered. 7-Eleven referred initially to the hours the store was open, but now most run 24 hours a day. Nintendo 64 was a reference to the substantial (at the time) computing power of the game system, but was rapidly made obsolete. There is even a little science behind which numbers work well in brand names. A study published in the April 2011 issue of Journal of Marketing Research theorized that numbers such as 10, 12, and 24 are more comfortable to consumers because they are answers to common grade school questions. So for all the intentionality in creating a brand using a number, it is often serendipity that leads to the numbers that stick. If you want to create a brand name around a number, try these tips: keep it three digits or fewer for memorability, think ahead (20th Century Fox didn’t, Century 21 Realty did) and accept that the original meaning may be lost over time.